World Aids day 2011: Want to get to zero? Deal with TB! Yet another World AIDS Day is looming ahead and it’s time to reinforce our commitment to ‘Get to Zero’. Jojanneke Nieuwenhuis, a regular now on JATB writes on this importance of dealing with the dual infections of HIV and TB if we need to achieve this goal of ‘Getting to Zero’. JATB is honoured to feature her. A giant condom will be ‘wrapped’ around the Dutch Munt Tower in Amsterdam this week. It’s probably one of the more striking activities that will mark World Aids Day. Meetings, film-viewings, theatre plays, articles, brochures and many other happenings will call upon people to join the fight against HIV and Aids. To effectively fight Aids though, we need to also fight tuberculosis. ‘Getting to zero’ is this year’s theme for World Aids Day. Getting to zero, backed by a United Nations campaign that will run until 2015, means zero new infections, zero discrimination and zero AIDS-related deaths; a bold and important aspiration. However, to get to zero AIDS-related deaths, we need to realise that one out of every four people living with HIV/Aids will die of tuberculosis. Worldwide, TB is the third most important killer of women, the second deadliest infectious disease and the leading cause of death among people with HIV-infection. HIV/Aids and TB are so deeply connected that they are often described as a ‘dual epidemic’. Each disease speeds up the progress of the other; HIV infection is the strongest risk factor for turning latent tuberculosis into active disease, while TB-bacteria accelerate the progress of AIDS infection in the patient. Getting to zero Aids-related death means having to deal with tuberculosis too. People living with HIV need to be often and properly screened for tuberculosis. They need to receive preventive treatment where necessary and they need to be treated fast and effectively in case of active disease. According to a global plan called ‘Time to act’, published by WHO, UNAIDS and the Stop TB Partnership, a million lives can be saved between now and 2015 by more effectively dealing with TB/HIV co-infection. Still, scientific modelling shows that tuberculosis will not be eliminated without new, more effective vaccines. Vaccines that are safe for HIV-infected children and that provide better protection against pulmonary TB. Over the past years, scientists have made tremendous progress in the development of these vaccines. We now need to call upon politicians, decision makers, industries and donors to provide them with all the support they need to deliver these vaccines and eliminate tuberculosis. 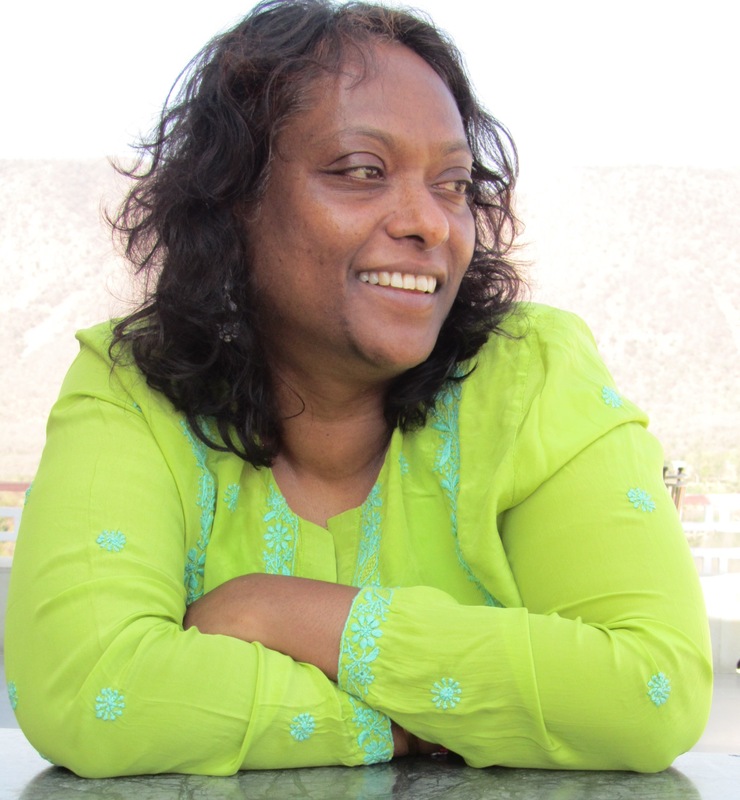 Blessina Kumar, TB Activist makes an impassioned plea on behalf of children suffering from TB. JATB is honoured to feature her. Each year 14th of November is celebrated as Children’s Day in India and as part of this celebration a workshop was organized by GHA India, titled ‘Towards Eliminating Pediatric TB’. The gathering had interesting and informative presentations from Dr. Ashok Kumar DDG, Health Services who heads the RNTCP, Dr. Sachdeva from Central TB Division, Dr. Sangeeta Sharma, Pediatrician from LRS Institute, Dr. Amdekar, a private practitioner and former president of the Indian Academy of Pediatrics, and a Civil Society representative. The highlight of the meeting was the sharing by the parents of 2 boys, Akshay and Pankaj aged 13 and 6 who were diagnosed with Extensively Drug resistant (XDR) TB about a year ago at LRS Institute by the pediatrician. The family hails from Punjab, a neighbouring state and when the children started getting sick, they ran from pillar to post before finally being referred to LRS Institute in Delhi. The pediatrician at LRS diagnosed them as having XDR, admitted them and asked them to purchase the medicines for treatment. The father is the only earning member in the family and works as a vegetable vendor. Their monthly income cannot be more than INR 3000 which is about 70 USD. The family was told that since they were not resident in this state they had to purchase the medicines themselves. This hospital catered to Delhi patients only. The family had to go back to their place and with no other means to pay for the expensive medication mortgaged their home for 200,000 INR, about 4000 USD and bought the medicines for their children. This put them at risk of losing their home, made them poorer and made them victims of stigma due to the sons’ illness. The boys have been removed from school by the principal. The mother with tears in her eyes wondered if they will ever get anyone to marry their two daughters with stigma, loss of home and forced extreme poverty. TB treatment is free in India. That is what the government claims and holds out its RNTCP programme as one to be emulated. Then why were these children refused free drugs? Is it because those suffering from MDR and XDR are not the state responsibility when it costs at least 200 times more for treatment of MDR and XDR compared to a 6 month treatment of drug sensitive TB? Who is responsible for making the already poor family poorer? Who will take responsibility for the complete violation of the rights of these two children? Who is going to pay? The buck needs to stop somewhere. Dr. Ashok Kumar in answer to the question regarding such incidents where patients were being sent away with prescriptions from many hospitals agreed to look into this and said that as head of the programme takes the blame for this serious mistake. I think we have all failed the children and are guilty. The National programme, the pediatrician who asked the family to purchase the medicines knowing they could not afford to, the hospital, civil society and activists for not doing what needed to be done and for turning a blind eye as children die of TB, one every 5mins……. Jojanneke Nieuwenhuis, Associate Communications and Advocacy Relations, TuBerculosis Vaccine Initiative (TBVI), makes a powerful case for funding for new TB vaccine development. During the 42nd Union World Conference on Lung Health in France, advocates sat together to discuss how to make a better case for investment in new tools to control tuberculosis. 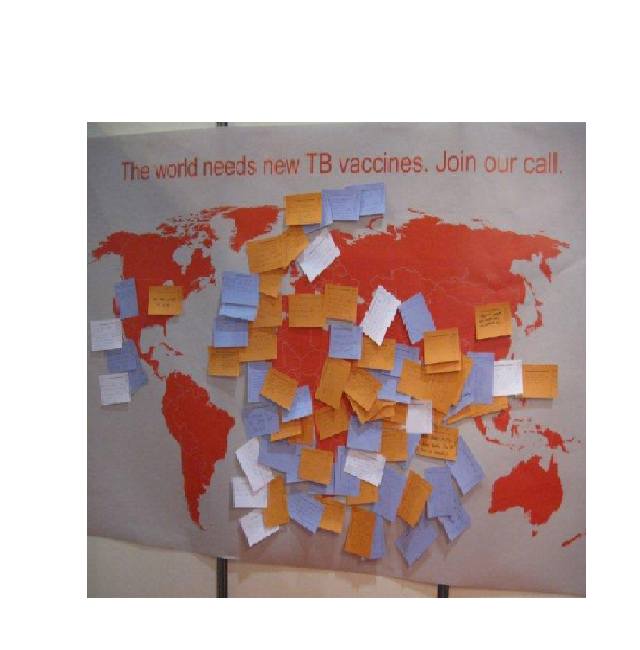 Dr Vandeputte hosted a seminar explaining how TBVI learned to broaden the range of arguments that can be used to convince politicians and decision makers to invest in the fight against tuberculosis and specifically in new TB vaccines. Nearly one and a half million people die from TB every year, leaving millions and millions of children orphaned. Annually, nearly nine million people fall ill with this devastating disease. In people living with HIV, tuberculosis is one of the main causes of death. These arguments however, don’t seem to be sufficient to provide the needed resources to eliminate the disease. Advocates struggle to get and keep tuberculosis on the agenda and funding for research and development fell flat in 2010, compared to 2009. TBVI knocked on every door asking for grant money to develop new vaccines. We met friendly and less friendly faces without tangible success. Eventually people told us to create a business case, to show why it’s economically responsible to invest in these research projects. So that is what TBVI did: costs and benefits were calculated, an innovative funding model was designed. The organisation is now working with European decision makers to try and get the investment plans approved. An amount of 560 million euros, spread over ten years, should be enough to bring one or two vaccines, perhaps more, out of TBVI’s portfolio to a point where private sector can take over. TBVI’s funding model is based on the idea that European governments can back the organisation to leverage money from European institutions such as the European Investment Bank. The invested money will be paid back through royalties and exit fees on successful vaccine candidates. The views expressed here are of the author. 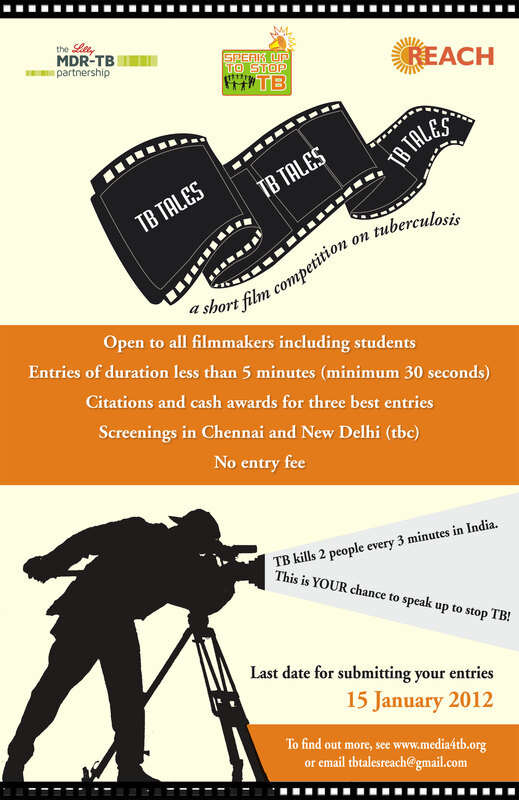 REACH, a Chennai-based non-profit organisation dedicated to the fight against tuberculosis (TB), has announced ‘TB Tales’ a short film competition on TB. The competition is open to filmmakers across India, including professionals, amateurs and students. All entries will be judged by an eminent jury that includes actor Suriya, film director Gautham Menon, Dr P R Narayanan, Former Director, Tuberculosis Research Centre, Blessina Kumar, activist and Vice Chair, Stop TB Partnership Board and Dr Subhash Yadav, Technical Officer, The Union South East Asia Office. The best entries to TB Tales will receive citations and cash awards of Rs. 30,000 (first place), Rs. 20,000 (second place) and Rs. 10,000 (third place). Shortlisted entries will be screened in New Delhi and Chennai and awards will be presented on World TB Day 2012. TBVI together with Aeras was present at the 42nd Union world conference on Lung Health in Lille with a joint booth. In the booth visitors were requested to join a call for new vaccines, which resulted in broad support. The responses were varied and interesting as the linked presentation demonstrates. The Stop TB Partnership, on 26 October 2011, announced the winners of the Award for Excellence in Reporting on TB and Images to Stop TB Award at Lille, France. The journalism award recognizes outstanding reporting and commentary in print and on the web that materially increases the public’s knowledge and understanding of TB and multidrug-resistant TB (MDR-TB), in countries affected by the disease. The Partnership confers first, second and third prizes in two categories: for journalists based in low- and middle-income countries and those based in high-income countries*. The Images to Stop TB Award seeks to raise awareness about TB through the powerful medium of photography. Every year the award provides one talented photographer with the support needed to generate outstanding photographs and photo stories depicting the impact of TB on individuals and communities and successful responses to the disease. Photojournalist Gary Knight serves as Chair of the award’s Advisory Board. Both awards are supported by the Lilly MDR-TB Partnership. First prize (US$ 3000): Bharathi Ghanashyam of India. Her blog, “Children and TB – the diagnostic challenges” tells the moving stories of three children affected by TB while highlighting the challenge of diagnosing the disease in this age group in India, where the problem is rampant. Second prize (US$ 2000): David Dizon of the Philippines. His article “Stigma still a hindrance in TB prevention”, published on ABS-CBN News Online, draws on the personal experience of having his baby become ill with TB to focus attention on fearful attitudes in Manila about seeking diagnosis when TB symptoms appear. Third prize (US$ 1000): Evelyn Lirri of Uganda. “Tuberculosis is curable but is still a silent killer in Uganda”, published in the Saturday Monitor, challenges her country to do more to tackle its TB and TB/HIV epidemics. First prize (US$ 3000): Michael Specter of the United States. His feature in the New Yorker, “A Deadly Misdiagnosis”, warns of the dangers of TB misdiagnosis in India, which has the highest rate of TB in the world and also points to recently developed molecular tests as offering hope. Second prize (US$ 2000): Ray Suarez of the United States. His blog on the PBS News Hour web site, “South Africa Still Struggling with Deadly TB-HIV Epidemic”, reports on how South Africa is striving to meet the challenge of its TB/HIV and MDR-TB epidemics. Third prize (US$ 1000): Jason Overdorf of the United States. His article, “India: As the middle class rises, so does tuberculosis”, published in the Global Post, overturns misconceptions that TB affects only the poor, but instead is striking a growing number of affluent people in India. The 2011 winner is the Mexican photographer Carlos Cazalis. Mr Cazalis’ portfolio, which chronicles the health challenges faced by the people of Haiti, was selected by an international jury from among 50 entries. He will receive a grant of $5000 to produce a photo essay on TB and $5000 in prize money.